The Big Ten isn’t waiting on the NCAA to mandate multi-year scholarships. It’s moving ahead on its own. … Buckeyes, as well as players at most — if not all — Big Ten schools and some other programs around the country, are signing four-year scholarships instead of renewable one-year scholarships, as has been the standard. After an NCAA rule change, Big Ten commissioner Jim Delany encouraged conference schools to offer four-year grants. The SEC has declined to follow the Big Ten’s lead, although individual schools are free to do so. In the Southeastern Conference, money isn’t an issue, but some conference coaches, like South Carolina’s Steve Spurrier, have come out publicly against multi-year offers, saying players need to continue to earn their way. SEC commissioner Mike Slive, however, has publicly supported multi-year scholarships, and Greg Sankey, the SEC associate commissioner for compliance, said Tuesday that Slive maintains that stance. However, for now, SEC schools made their own calls without conference input. “We took the less regulatory approach to see how this is implemented across the country,” Sankey said. Translation: we’ll wait and see if this starts costing our member programs recruits. If it does, expect Steve Spurrier to find religion on the matter. For now, the fast and quick guys are going to U.S.C., Alabama, L.S.U. and the like. The fast but not quick guys are going to B.Y.U., Kansas State, Missouri and the like, programs that seem to be doing fine with the hand they’re dealt. The not-so-fast and not-so-quick guys go to the Sun Belt. That’s signing day in a nutshell. Now we can ignore the recently-committed recruits until they step onto practice fields in August. All the rest, as the wise man once said, is commentary. The thing is, we like the commentary… we need the commentary. For that, Groo’s got some handy links for us here. And remember, sometimes it’s about the food. This is Georgia Tech recruiting. 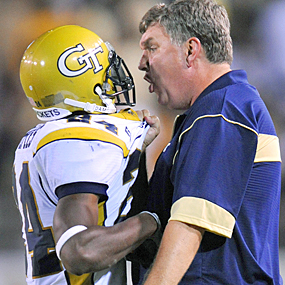 Paul Johnson's powers of persuasion ain't what they used to be. Michael Felder’s takedown of the hypocrisy of Johnson’s “no visit once you commit” policy is worth a read. “Over the past five years, the Jackets have landed only two of the 74 Georgia recruits ranked in ESPN’s top 150.” And both of those were signed by Chan Gailey. It’s tough to persuade commits to stay loyal when you’re penalized by the NCAA due to recruiting violations from having contact with them. … The SEC must persuade the NCAA to dump its requirements for a championship game. If that were to happen, the SEC could go to a divisionless format that would allow the league to protect the conference’s oldest rivalries and keep a good rotation going for non-permanent foes. Without divisions, the SEC could simply pair the teams with the two best SEC records in its championship game. Forget the problem of having the two best teams in one division. Without divisions, the two top teams in the league would always reach Atlanta. Oy. I know Pennington’s heart is in the right place – he’s trying to figure out a way to save traditional conference rivalries in the face of a fourteen-team league playing an eight-game conference schedule – but what he’s come up with is what I used to dislike about the Big Ten before it went divisional, on steroids. You wind up with a conference that’s too big to play round robin ball in the regular season, with all the issues that creates as to which school wins the regular season title, and you then make it worse in those years when there isn’t such a problem by requiring the team with the best regular season record to prove itself against a runner-up which doesn’t even have the justification of being a divisional champ as the basis for making a title game. That sounds like what people just got through bitching about with the BCS title game, no? Don’t blame Pennington, though. It’s a useful exercise to go through what he’s come up with. Nah, blame Mike Slive and the school officials he answers to for messing with a good thing in the name of jacking up the TV dollars. Particularly if the move to a seven-win qualification for bowl participation goes through, this round of SEC expansion is going to go down as awkward at best, because that will surely end the possibility of a nine-game conference schedule. The people running the show had best hope it’s not any worse. It turns out they’ve got something else in common. In what sounds eerily like what’s happened to Junior’s only recruiting class, Auburn is also going through an impressive rate of attrition. … The missing signees are spread out among positions. They include six offensive linemen, four wide receivers, four defensive backs, three linebackers, three running backs and three defensive linemen. They’re not just fringe players. Forty percent of Auburn’s four- or five-star signees listed by Rivals.com from those years are gone. That doesn’t include five-star offensive lineman Shon Coleman, who hasn’t played while fighting cancer and remains in the program. Maybe that’s just a coincidence; Auburn hasn’t lost a single kid from its last class. But it’s a weird one. Does it take time for a new staff to shake off some of the mercenary vibes before settling in? Or do Trooper and the Laner have something more in common? Name that caption: he’s tanned, rested and ready. He’s getting ready to punch himself… or point with both fingers. Either that, or he’s about to launch into an “I’m a man” tirade.